Despite being so little, in the near future, today’s kindergarten and elementary school students will be shaping the world around us. This is why they should be surrounded by beauty from a young age – it is important to help shape their tastes and general sense of aesthetics. 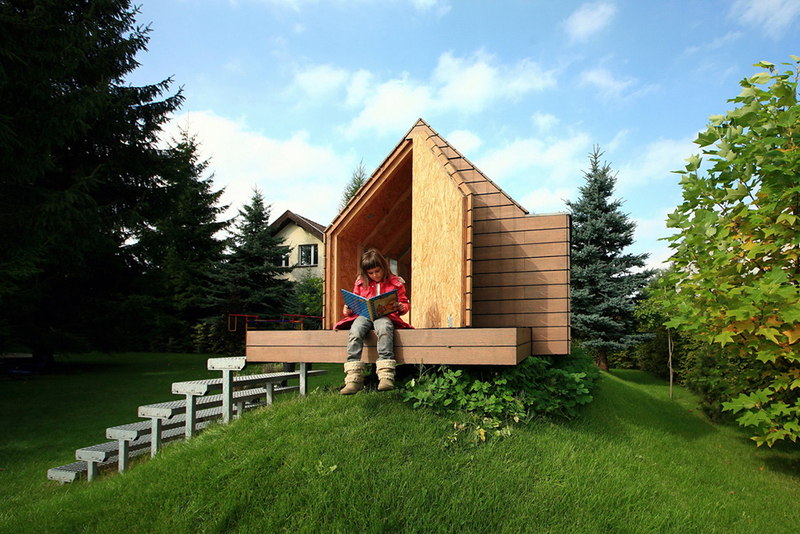 Take a look at Polish architecture created especially for these youngsters! Intended for the youngest audiences, Baj Pomorski Theatre in Toruń is still considered one of the most popular and, at the same time, most controversial buildings erected in the past few years. It was designed by Ambit Studio, run by Elżbieta and Mateusz Grochocki, as the new headquarters for the 60-year-old children’s theatre. Opened to the public in 2006, the building is very original, but also very ‘literal’ in form. Its façade looks like an open wardrobe, full of shelves, doors and hiding spots. Resembling this richly ornamented piece of furniture, the building is supposed to illustrate the wide range of adventures and emotions that can be experienced in the theatre. Located on the edge of the Old Town in Toruń, the building is mostly liked by its citizens – both children and adults alike. One cannot say it is unequivocally kitschy, yet its literality may raise a few eyebrows. Certainly, the Baj Pomorski theatre is a great starting point for a discussion on good taste in architecture. 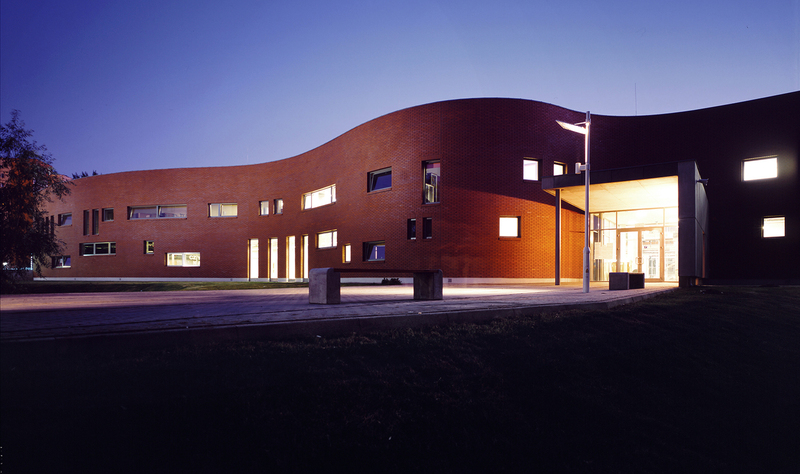 In 2003, when Tomasz Konior was in the process of designing this school building in Białołęka, it coincided with great changes that the Warsaw district was undergoing. Since the good old ‘tysiąclatki’ (‘thousand-year-olders’, as they are known) were still holding up – schools built in 1966 as a part of the communist regime’s social programme launched during celebrations of the Millennium of the Polish State – architects were only just beginning to experiment with modern educational facilities. Konior’s brick building on Vincent van Gogh Street is very spacious. Outside of the school, the building also house spaces for extra-curricular activities, a large library and sports complex. 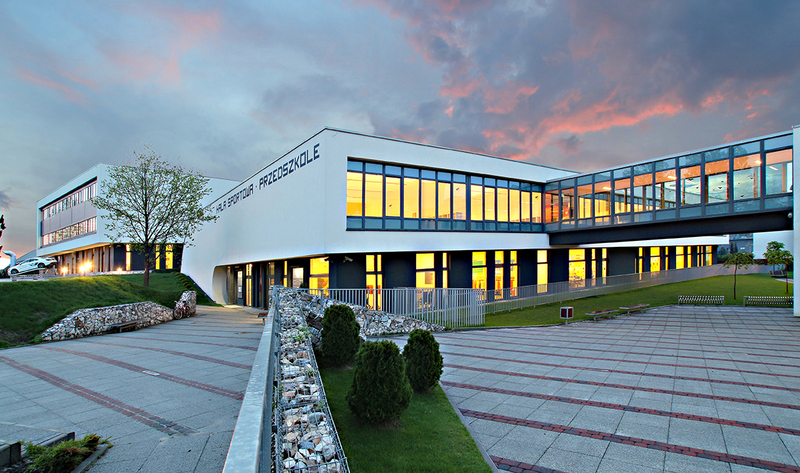 Despite being so big, the school seems very cosy thanks to its unique design – it is surrounded by old trees near the Vistula river. The softly winding façade encloses a series of pavilions, glassed-in wings, pitches and courtyards set up around the complex. Although its construction was already completed a dozen years ago, the school is still considered an example of great architecture for children. Konior created an what seems like an austere building from the outside, using only bricks and concrete, that includes bright and fun elements such as skylights and colourful flooring on the inside. The school is kid-friendly without a dose of infantilism. Its vital features are plenty of open, sunlit spaces which encourage pupils to spend time together. This exceptionally designed facility is perfectly suited to the needs of its pre-schoolers. This small building, designed by XYSTUDIO in 2015, was built on the grounds of the former Forte furniture factory in Ostrów Mazowiecka. Rumour has it that the factory owner was persuaded by his daughters to invest in the pre-school for his workers’ children. Unfortunately, providing facilities and social benefits which make employees’ lives easier is still not very common in Poland. However, the Ostrów Mazowiecka factory has taken a big stuff forward, which has led to the creation of a beautiful building, to be enjoyed by the youngsters, their guardians and their teachers. The adventures of Koziołek Matołek (Matołek the Billy-goat) were written by Kornel Makuszyński and illustrated by Marian Walentynowicz in the 1930s. The stories centre around the quest Koziołek Matołek’s quest to find the city of Pacanów, a town where it is rumoured they make shoes for goats. Even though the comic is quite old, the story is still very popular among children, so it is no surprise that a facility which honours the courageous and unlucky goat was opened as soon as the town of Pacanów received funds from the European Union in 2010. The Koziołek Matołek Fairytale Centre was designed by architects from Bogdan Kulczyński’s studio. The building is quite unusual: the central part of the facility is hidden behind a wooden-mesh construction. It is located between two squat ‘towers’ which bring to mind sandcastles. Even though the shape is quite unique, its exterior aesthetic is not the most important part of it – it is merely the setting for children to enjoy numerous activities and attractions. The centre is fully interactive. Young visitors have an opportunity to take part in a plenitude of activities and games. They can learn and have fun both inside and outside of the building, which is surrounded by green spaces designed especially for children. An educational park is in the works and is planned to open in 2020. Służew nad Dolinką is a huge housing estate which was built in the 1970s – it replaced a local village. It was this village which inspired the architects from WWAA and 137kilo studios to create their winning design of the Służew Culture House for the 2008 architectural competition. As a result, the large housing estate comprised of large communist blocks of flats met its new neighbour: a beautiful ‘settlement’ immersed in greenery with wooden cottages, terraces, an amphitheatre, a vegetable garden and even an enclosure for goats. The architects’ greatest success is that they managed to create a truly modern 21st-century facility so visibly rooted in the rural roots of the location. Even though the cultural centre offers activities for people of all ages, the designers paid a lot of attention to the needs of children. The centre’s youngest visitors can enjoy petting goats, learn how to grow vegetables, and reach the summit of the climbing wall on the back of the facility. They can also play on the simple playground which is nicely integrated with the surrounding greenery. 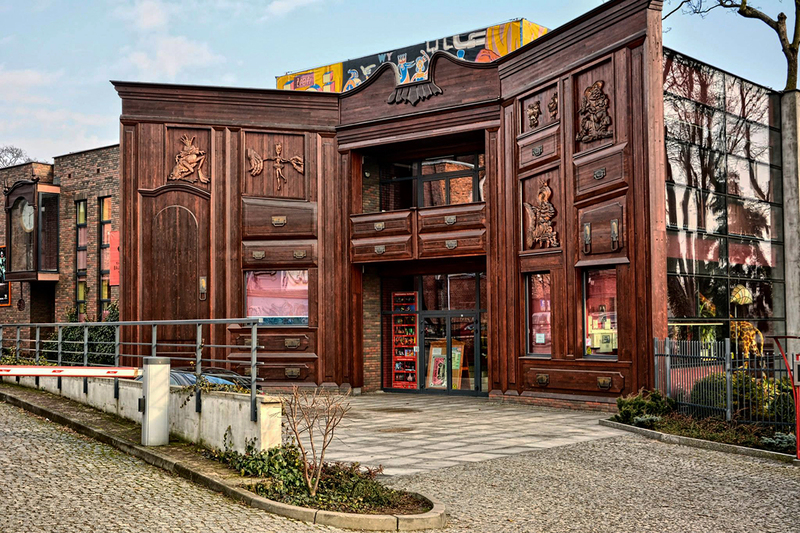 The Służew Culture House is clear proof that architecture can both shape aesthetic tastes as well as encourage people – young and old – to try new things. 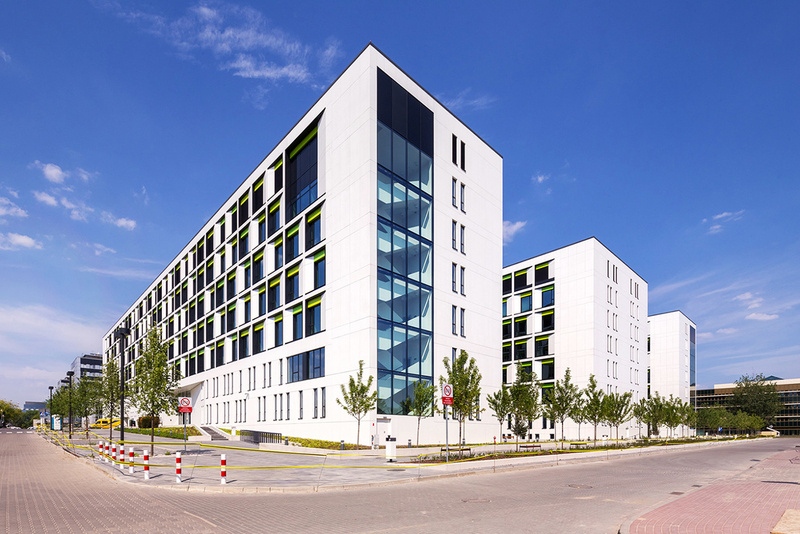 Recently, a large housing estate was built on a 20-hectare piece of land in the south-western outskirts of Katowice. What is so special about it? The building developer added on a vast educational and sports complex, which is quite rare. It includes a pre-school, elementary school, middle school, language school and sports hall. It was designed by the Małeccy Project Office. It is a complex comprised of plain, two-storey building with connectors located on the first floor. The buildings do not seem too overwhelming thanks to the shortening of the lowest floors, and horizontal bands of windows. White façades contrast with the dark window frames. The design was clearly inspired by modernism – its order and simplicity proved to be the right choice for this large, but unimposing complex. As architects, we obviously tried to educate our little ‘investor’ that a pretty house would be one with a flat roof. But in Maja’s 6-year–old imagination a house is an archetypical house: she always draws it with a chimney, a window and a large, sloping roof. UA compromise was reached thanks to a design by famous Swiss architects, Jacques Herzog and Pierre de Meuron. It inspired both the young inhabitant and the designers: an ‘adult’ design by well-known designers was translated into the construction of a house for a child. A paediatric hospital has to comply with the same functional, security, hygiene and technical requirements as a regular public hospital The key difference is though, that it has to cater to the youngest of patients – going into the hospital is a scary experience. A hospital intended for youngsters has to be not just more kid-friendly, but just plain friendly. The glass main hall connects all of the storeys above ground and is an intersection for all the wards. Besides this function, it also serves as a recreation area for patients and their families. Even though the building has many signs of its young patients’ presence (like pictures on the walls), it has not been overloaded by decorations. Its main features are bright, pastel colours, which make the whole facility less overwhelming and more child-friendly. The plan was to build a new complex of school buildings that would provide space for the 400 elementary school pupils and 100 kindergarten kids in Maślice, a housing estate in Wrocław. This challenging venture of building a large facility for children of different ages was undertaken by the Synergia Group. Besides functionality, it was important to ensure the pupils’ comfort and security. 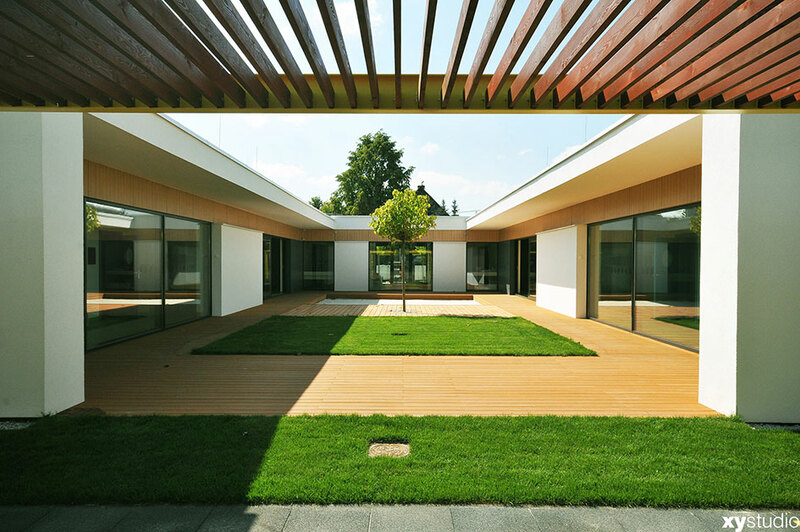 The architects opted for a design called a ‘hall-comb system’ – each section is enclosed in a separate pavilion and added to the long main building. This architectural solution made it easy to separate the youngest pupils from the older kids without closing them of from their surroundings. Each section of the building (the kindergarten, school, sports hall, library, etc.) is distinguishable by a different colour façade and big signs on the exterior walls. The complex has an original form interspersed with steel. It makes the whole building look as if it was composed of the fashionable containers. Moreover, the design focused on balanced and energy-saving solutions, so the whole building uses renewable sources of energy.